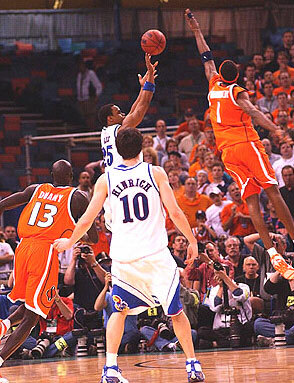 Hakim Warrick was a tall lanky power forward, the prototypical Jim Boeheim forward. With a tremendous vertical leap, Warrick was one of the best dunkers in Syracuse history. Because of his size and length, he was extremely effective in the zone defense. Hak's trademark move was his drop step, where he seemingly could cover the entire free throw lane with one step and spin, then finish off the play with a finger roll or a dunk. Hak steadily improved each year he played, earning the Big East's most improved player his sophomore season. Never a great ball handler; during his senior season he finally was able to display a nice shot facing the basket, though he took it infrequently. Warrick was the Big East Player of the Year his senior season, and made the All-Big East First Team twice. His sophomore year he was the league's Most Improved Player and made the Big East Third Team. During his senior season he led Syracuse to the Big East Championship and earned the Big East Tournament MVP. That same year he was named an AP All-American. The highlight of Warrick's career is now the highlight of the Syracuse basketball program's history. With time running out in the 2003 National Championship game, Kansas' Mike Lee had the ball and was all alone in the corner with an open shot at a 3 point basket and a chance to tie the game. Warrick, who had been moved to center defensively for that last play, sprang out of no where and cleanly blocked the shot well out of bounds, securing the first NCAA Tournament Championship for the Orangemen. Warrick was the 19th pick (1st round) of the Memphis Grizzlies in the 2005 NBA draft. He would be a frequently used reserve player his rookie season. Warrick blossomed his second season and was a frequent starter for the Grizzlies, averaging 12.7 points per game. Warrick would join the Milwaukee Bucks in the summer of 2009 after becoming a free agent, and would be traded to Chicago mid-season. After the 2009-2010 season he was traded to the Phoenix Suns. In the summer of 2012 he was traded to New Orleans, and after one game in 2012, he was traded to the Charlotte Bobcats.